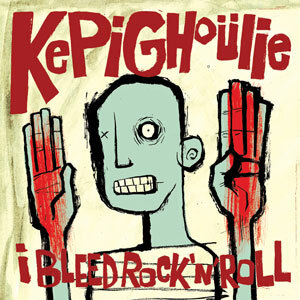 Kepi Ghoulie is a Rock N Roll Shark who also happens to bleed Rock N Roll. Don’t believe me? Perhaps then you should check out Kepi’s new solo release, “I Bleed Rock N Roll”, out now on Asian Man Records. You might be familiar with Kepi as the frontman of the Groovie Ghoulies. Perhaps you’re not familiar with Kepi at all? Too bad I say. Either way Kepi is doing the solo thing now, and he’s doing it well. I Bleed Rock N Roll is a 13 track testament to Kepi’s ability to create compelling, catchy, and very danceable pop-punk. The songs on the new album, in general, pay homage to 50s style rock albeit with more modern tones and pace laced in. There is, despite the pop-punk trappings, also an unusual dark side preset. When Kepi’s singing, “What the world needs now is love sweet love”, it’s as if he’s possessed by the worlds friendliest devil; very much the lightest side of darkness ever. I’m even going to suggest that Kepi Ghoulie is the Bizarro counterpart to Rob Zombie, if you get where I’m going with that. If you want evidence to my assertion, track eight, “I Just Wanted You To Know” clocks in at precisely 3:33 and reminds me of the Cowboy Junkies, so, um take that. All in all, I Bleed Rock N Roll does what it says; 13 tracks of pure rock and roll, each one nearly even in rocking as they are rolling. Balance is crucial. And as if the rock alone (and also the roll of course) wasn’t enough there are some awfully clever lyrics in play too. “Don’t try to figure me out because I’m rather unfigueroutable” and “I’m a rock n roll shark. I gotta keep moving’ I gotta keep swimmin’”’ are just some small examples. Damn fine wordsmithing inside indeed. So if you were a fan of Groovie Ghoulies, or just want a tasty new Rock N Roll treat, stop over to Asian Man Records and pick up a copy or two. I swear you won’t regret it.